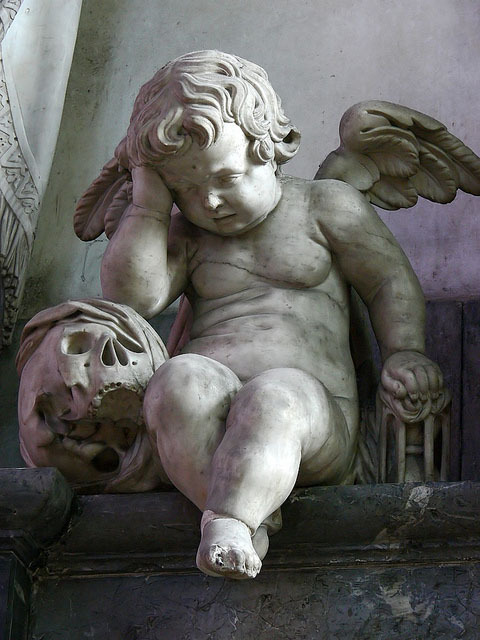 The Weeping Angel of the Amiens Cathedral is described as a cherub, but were it not for his tears, we would mistake him for a putto (plural putti), a plump little angel hovering above in a Nativity scene, in Christian iconography, or above lovers, in secular iconography. In the Tale of Cupid and Psyche, Cupid is an oversized putto who does not belong to religious angelology. The angel’s right hand is set on an hourglass symbolizing the brevity of life. As for his left elbow, it rests on the skull of a skeleton, a symbol of death. 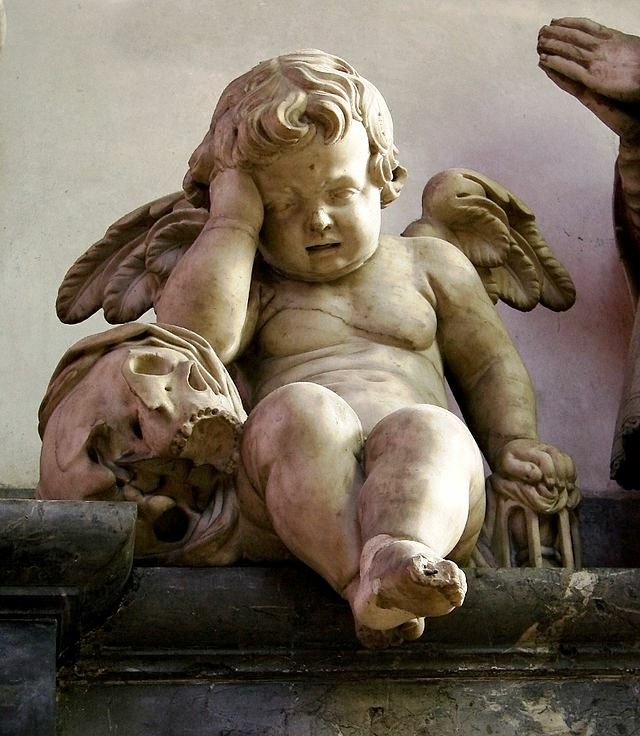 The statue of the weeping angel adorns the funerary monument of canon Guilain Lucas who died in 1628. In the 17th century, before advances in medicine and hygiene, children often died at an early age. Youth and death were therefore closely linked, the two being at all times the opposite sides of the same coin. Dead children are still called “little angels.” Blasset himself executed the funerary monument of his eight-year-old son. Amiens is the capital of the French Department of Somme, in Northern France, where one of the bloodiest battles in history was fought. It opposed Anglo-French forces and German forces and took place between 1st July and 18th November 1916, wounding or taking the life of more than 1,000,000 soldiers. On 1st July alone, British forces sustained 60,000 casualties. Field Marshal Douglas Haig and General Henry Seymour Rawlinson took much of the blame for the loss of so many lives, but war is war. The Battle was meant to be an Anglo-French offensive. The Battle of the Somme — the Somme is a river, is considered the beginning of modern all-arms warfare. (See Battle of the Somme, Wikipedia.) For the first time, a tank, un char d’assaut, was used. The French account of the Battle of the Somme has yet to be translated into English. Beginning with the Battle of the Somme and throughout the remainder of World War I, soldiers who survived death started buying memorabilia featuring the Weeping Angel: various items, but post cards in particular. These they sent to family, fiancé(e)s, and friends throughout the Commonwealth, including Canada. Until recently, young men who had survived childhood often died on battle fields in the prime of life. This would explain, I am told, the low birth rate in France following the Napoleonic Wars. War followed war, so why have children who could be cannon fodder. Napoleon’s grande armée (FR) was decimated. In fact, several soldiers who had survived the journey to Russia did not return to France, fearing for their lives. They did not have winter garments and therefore settled in Russia. César Cui (18 January 1835 – 13 March 1918), one of “The Five” Russian composers, was a descendant of a soldier who would not undertake the march back to France. “The Five” aimed at creating a special idiom for Russian music. Tchaikovsky (7 May 1840 – 6 November 1893), however, composed European music. Although L’Ange pleureur became very popular during World War I, it is a sculpture dating back to 17th-century France. The grande armée and the vanitas constitute central themes in the age of the divine rights of kings. 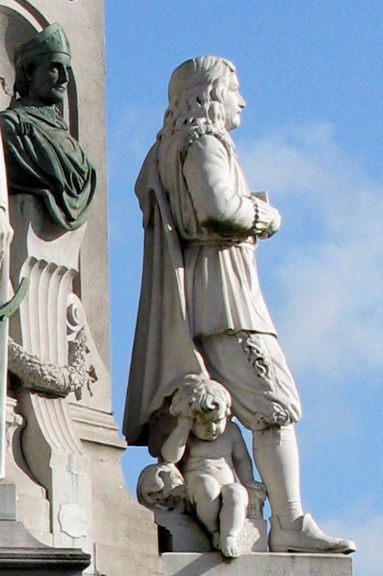 No one but God stood above Louis XIV, the Sun King. Therefore, only the sermons of eloquent preacher Bossuet, could instil fear of God—not reverence—in his king. Louis would have to answer to a superior power: God. We have seen in earlier posts that the still-lifes of 17th-century Dutch artists were also vanitas. The props were skulls (crânes) and hourglasses (sabliers). Also associated with these themes is the carpe diem: Gather ye rosebuds while ye may. The carpe diem enjoins humans to enjoy life to the full as they will grow old and die. The carpe diem (seize the day) is the reverse side of a memento mori (remember death). Apologies for such a late answer. I started blogging in 2011. I enjoy this kind of work. Best. Hey There. I found your blog using msn. This is a perfectly written post. I’ll be sure to bookmark it as well as return to read more of your beneficial information. Thanks for the post. As I site owner I believe the articles material here is extremely great. Thank you so much. One wishes to pick up and comfort the angel of Amiens. And Amiens belongs to your childhood. I hope you enjoyed Christmas and send my best wishes for the New Year. How very sweet of you. I’ll follow the rules. Thank you. It will wait until tomorrow. What a lovely award. Reblogged this on To Be By Your Side. Thank you so much for reblogging my post on a truly charming little angel. I will keep you in my thoughts. It is interesting to know that Amiens belongs to your childhood. We do not forget, do we. That angel is marvellous symbol and the soldiers knew.